PS4 version tested. Review code provided by the publisher. Last year we saw the two titans of the music genre resurrect. 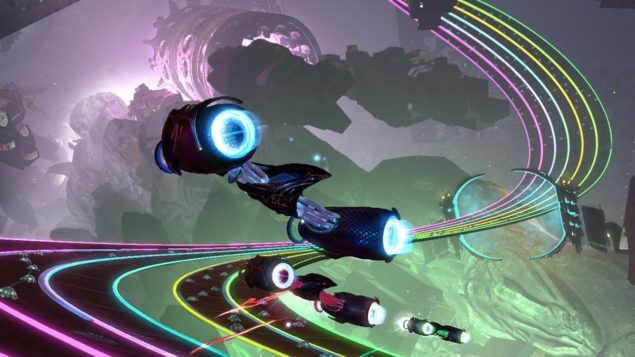 Now, this early in 2016, we get the chance to take a look at another, longer lost, legend of the music genre: Amplitude. Although it might not be as well-known as Guitar Hero or Rock Band, Amplitude does have a niche audience from its glory days. For you might not have heard of it before, but this isn’t Ampiltude’s first outing, as it once existed back in the humble days of the PS2. It was a bit of a cult hit, and after a successful Kickstarter is now back to recapture the hearts of everyone who can handle the bright lights and neon tunes. It might look familiar at first, with a set of bars scrolling down towards you, but unlike the other games, you’ll be responsible for everything from the synthesizer to the vocals. Rather than selecting an instrument from the off and completing a song, you can experience the entire spectrum of a track taking on one part at a time. Each track is broken down into segments, and once you’ve completed one, you’ll have to jump to another bar, as you can’t stick to one instrument for long. It’s easier to understand than explain. Essentially the gameplay is designed to reward faster, lightning fast reflexes. Once you have gotten the basics, you’ll have to start anticipating your next move. No longer are you able to just react to the button prompts flying you, but choose the best path to travel down. Most songs seem to have up to four or five tracks at any given time, though it can be hard to judge as they move, appear and disappear throughout the song. The hard part of jumping to another track is catching the first note. But it adds another layer to the game you won’t find in the musical genre, an agency that the player has to make a choice, and doing it well. That being said, the player shouldn’t expect an easy ride down the tracks of Amplitude. Although the control scheme in the simplest form is little more than three buttons and a thumbstick, the timing and precision is something even fans of Guitar Hero are going to struggle with initially. 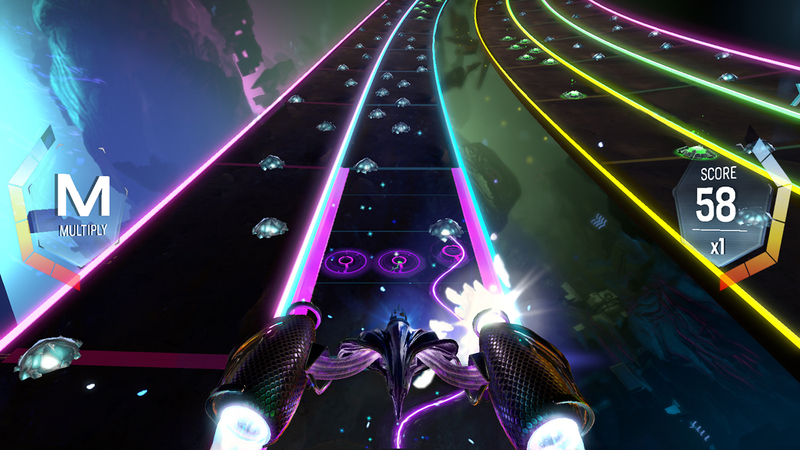 Amplitude does have a range of difficulty settings that encompass every song so you can develop at your own pace. The lower difficulties will feel a little tedious while jump upwards is a very enjoyable, challenging experience. Trying to achieve 100% on any song will take practice. Missing a single note on any given section will lock you out for that duration. Pre-emptively jumping from a track will also break your combo as well, which means monitoring every beat as it approaches. It’s not exactly like anything else you will have played, assuming you missed the original game on PS2, but it feels familiar enough for you to get to grips with everything you need nice and quickly. This means you can rapidly begin to start challenging yourself and get into the most fun you’ll have in the game. Like all games in the field, true enjoyment is achieved when you can perfectly synchronize with the music, and this game allows to control all of it. The big differences between the Guitar Hero and Amplitude are easy to address, with one of the most noticeable being that you won’t recognize any of the songs. The tracks are all a mix of a strange technophonic blend of pulses and waves you may almost remember from drunken nightclub dance floors. They are hardly offensive to the ears, and can have a catchy rhythm that you can bounce along too. The lyrics are a little repetitive and lacking in the imagination the rest of the song upholds, so you won’t be singing along to them, which is a shame, as they won’t hold the memorable awe of classic rock songs. While the playlist might not have the same appeal, the game is clearly made more for immersing yourself in the music than listening to it wholesale. And that is a very good experience, you’ll hear the different components that you’re riding down get louder, so you can really feel how you’re controlling and helping create the tune. 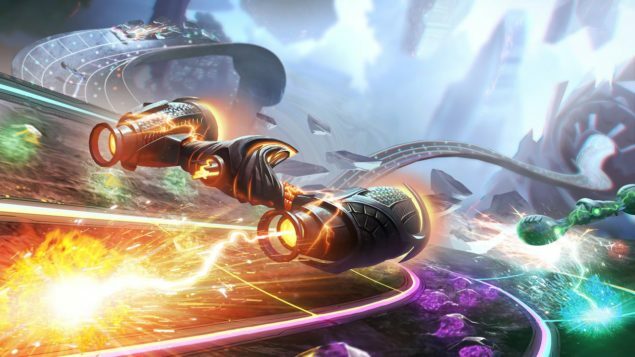 Like other music themed games, Amplitude is best enjoyed with friends. In multiplayer you’ll find two or more ‘ships’ riding down the tracks that create the song, and you can swap between any bar you’d like. You’ll have to make sure not to get stuck behind each other which adds an extra area of concentration to the walking away with a good score. With up to four players you can get into some very noisy, very messy, situations but it’s a great distraction. Amplitude is a great little music game. It doesn’t have the same feeling as the bigger names, nor engrossing phoney instruments to bash around on. What it does have, though, is a little something special that can keep you coming back for more. You might not play Amplitude for long stretches of time, but its fast paced gameplay and mad visuals will be a great break from your day to day routine, even if it’s just for a song or two.